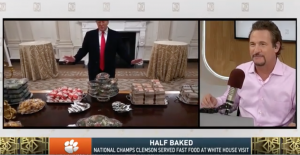 Sports radio talk show host Jim Rome discovered on Tuesday the true controversy of President Donald Trump serving fast food to the Clemson University football team. Trump hosted the Clemson football team on Monday after they won the national championship. But due to the partial government shutdown, some of the White House staff is furloughed, so Trump announced that he would pay for a spread of fast food for the players to feast on. Before the event, Trump told reporters the White House would be serving "McDonald's, Wendy's and Burger King's with some pizza." Pictures of Trump behind the buffet of fast food went viral on social media. Everyone at the event appeared to have fun, including Clemson quarterback Taylor Lawerence, who said he couldn't wait to go back to the White House. But the event wasn't without controversy. While opponents of the president tried to "fact-check" his remarks or claim that it was beneath the presidency to serve this food, Rome discovered the real controversy is not serving fast food when it is hot. "I am not here to argue about whether or not it was a good idea to order a bunch of fast food to celebrate a national championship. You can argue about that some place else … My beef with this beef is not about the quality of it, or even the quantity of it. What I am about to say is fact, and there is no room for debate. Fact number one, everybody loves fast food. Fact number two, nobody loves fast food that has been sitting out for even a second. You see, ordering fast food is not the problem. Not giving it to the guests the second they arrive is." Rome continued on how serving fast food cold is the problem. "Eating fast food at the White House is totally fine and in fact, better than fine. Eating fast food off White House china is cool. Eating cold fast food off anything is horrible," Rome said. Rome also stated his disdain that the fish filet was served at the White House.